It's a curious thing about Doctor Who monsters. The Ice Warriors have appeared in only four Doctor Who stories (The Ice Warriors, The Seeds of Death, The Monster of Peladon and its sequel, The Curse of Peladon), yet they have been listed as among the best Who monsters. While the Ice Warriors would not make a return appearance on Doctor Who until 2013's Cold War, they still remain wildly popular (even if Cold War significantly altered them to where they are unrecognizable from their first appearance). The Ice Warriors is partially lost, but the animated reconstruction of Episodes Two & Three of the six-part story allows us to get a glimpse of one of the most impressive debuts of any Doctor Who monsters. 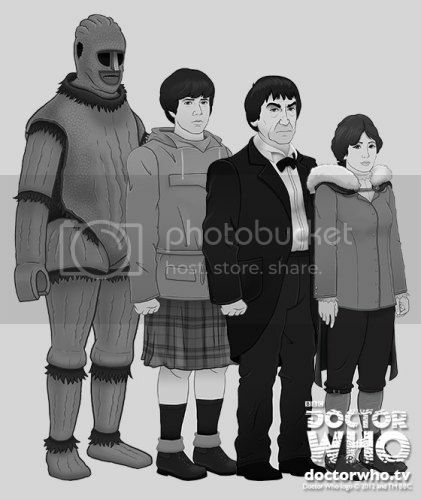 The Doctor (Patrick Troughton) and his Companions Jamie McCrimmon (Frazer Hines) and Victoria Waterfield (Deborah Watling) arrive in a winter setting. They discover they are on Earth, but that the Earth is undergoing a new Ice Age. The glaciers are kept at bay by various stations, and the trio find themselves at the Brittanicus station, where they come into a great crisis. Leader Clent (Peter Barkworth), who trusts the computer and computer alone, struggles to maintain the ionizer levels at enough strength to keep the glaciers from overwhelming them while not going so far that the station would destroy it all. Meanwhile, Scientist Arden (George Waring) makes a curious discovery: a giant humanoid creature buried within the ice. He brings it in, thinking it is the remains of a prehistoric civilization. However, far from being dead, the heat has revived this 'ice warrior', named Varga (Bernard Bresslaw) who takes Victoria prisoner. Clent and his second-in-command, Miss Garrett (Wendy Gifford) are more concerned over maintaining the ionizer levels than on one girl (especially since the computer insists things go as scheduled). Reluctantly, and especially since the Doctor has been so helpful to their enterprise, he allows Arden and Jamie to go search for her. Unbeknown to them, renegade scientist Penley (Peter Sallis), who left the station because he trusts humans not machines, has been monitoring the situation. He and Storr (Angus Lennie), a scavenger who detests science and scientists who caused the Ice Age, know of the Ice Warriors, whom Varga has brought back to life. The plan is simple: the Ice Warriors, finding this a hospitable place with Mars (their home world) out of reach, perhaps lost forever, will take Earth. The Doctor wants only to rescue Victoria, keep both her and Jamie safe and prevent loss of life on either side. However, things had gotten out of control. The Ice Warriors have already killed Arden and Storr, heavily injuring Jamie. The station has high concerns about the Warriors spaceship: continued use of the ionizer could make the Warriors' ship explode, not just killing them but allowing the glacier to overwhelm the world. Clent in particular will not act without the computer's views, irritating the Doctor and Penley, with Miss Garrett wavering. 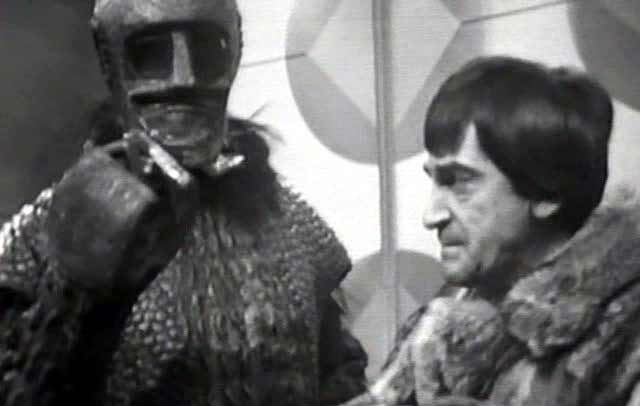 The Doctor allows himself to be captured by the Warriors to discover their plans, but armed with a secret weapon: ammonium sulphate, which will be harmful if not fatal to the Ice Warriors should they try anything. The Ice Warriors, now in full conquest mode, storm the station to take the mercury to power their ship. This will inhibit the ionizers from working, bringing total destruction. The Doctor has rigged the Warriors' sonic cannon to work against them, and in the end their ship is destroyed but causes no reaction that brings the station to destruction. Despite the loss of two episodes, The Ice Warriors itself remains wildly effective and well-crafted. One highly intelligent aspect of Bryan Hayles' script is that it speaks about the dangers of trusting too much in science and technology. The character of Clent, a bureaucrat who has risen despite no initiative, always trust the computer as if it were a divine voice. "If you want an impartial opinion, ask the computer," he says. Penley represents the opposite: the scientist who thinks humans are both more capable to figure out things but more importantly more important that machines. The conflict between humanity and technology has rarely been addressed so well, especially on a science-fiction program. We also learn that humanity, in its efforts at efficiency, can be more destructive and that worse, the cure can be worse than the disease. We learn that there are no plants or crops to give the growing population more living space (hence, the loss of farms). The loss of agriculture brings a decrease of carbon dioxide, which brought about the ice age. To keep the ice at bay, they set about these stations. In each step we see that humanity, in their desire to bring efficiency to the world, ends up only making a muck-up of everything. This story thread is not overtly stated, but I was fascinated that The Ice Warriors, at least in regards to this element of man's overreliance on technology, is far ahead of the curve. If one reads between the lines, we see The Ice Warriors address such issues as 'frankenfood' and the destruction of the rain forests via 'slash and burn' to provide temporary farm and grazing land. In the technical matters, The Ice Warriors does a lot with a limited budget. The massive ice caves are extraordinary and beautifully rendered. Certain sequences are enhanced with effective fog effects, making the setting more realistic. There were also certain sequences masterfully filmed (such as when the Ice Warriors are finally defeated, a particularly chilling moment...no pun intended). The score is also on the whole excellent: the vocal aspects did not drown out the music but complemented the scenes. The performances were also brilliant. Bresslaw, best known as a comic, was frightening as Varga, speaking in a whisper and elongated 'S' sounds. He set the standard to how an Ice Warrior speaks and moves, and the decision to make the Ice Warriors soft-spoken but still reptilian is a key element that makes them the effective monsters we all remember pre-Cold War. 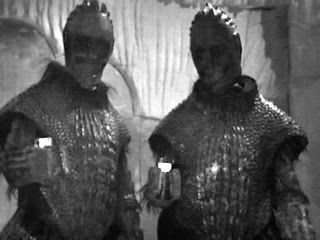 As a side note, seeing how effective and chilling the Ice Warriors were in their eponymous story and The Seeds of Death is one of the many reasons their return in Cold War so bloody disappointing. The performances of the guest stars were also excellent: the blind devotion Barkworth's Clent has to technology, the intellectual honesty of Sallis' Penley, the divided loyalties of Gifford's Garrett; each of them does a top job in terms of performance. If anything, I find great fault in Watling's Victoria, who came across as a slightly dim, screaming girl. Even (or perhaps especially) in the animated moments, Watling's performance came off as almost silly and laughable, as if either she didn't believe she was in the situations she was in or just didn't think it was worth it. The Ice Warriors keeps the pace well. It is beautifully filmed, excellently acted (with the possible exception of Watling, who did improve over the series) and is a brilliant introduction to monsters who, while limited in series, had and continue to have a great impact on Doctor Who itself.